Over the past few years Cyprus has been sinking ships in order to create artificial reefs. The need for this initiative has been the dwindling fish stocks around the island. The project is being financed to a great extent by the EU fisheries programme which has been running from 2007. Funding for the first reef was supported by the programme. 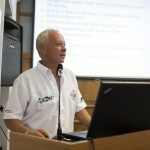 Contributions to the project have been made by the Cyprus Tourism Organisation (CTO) and the Cyprus Dive Centre Association. In August last year The Fisheries Department produced a film about the Artificial Reefs, and asked Jonathan to do the English voice over!! The film is now available and is a fascinating documentary. Fact – the development of Artificial Reefs is a must to restock dwindling fish life in Cypriot waters, as well as extending the tourist season for Cyprus, bringing more money into the economy and so making Cyprus a prosperous diving haven! 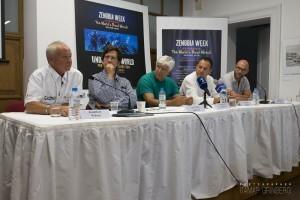 The recent Zenobia week conference on Artificial Reefs & The Financial Benefits for Cyprus was very interesting & informative with positive comments from all who atten ded. Jonathan Wilson presented a brief but detailed presentation on what Cyprus has successfully put in place so far, and what needs to be done in the immediate future to secure Cyprus as a successful high ranking place in the tourism industry. All vessels have proved to be successful on providing additional diving options for divers who travel to Cyprus, and of course for local Cypriot divers too! They have provided fantastic homes for an array of marine life previously only seen on the Zenobia, for example, Grouper, Barracuda, Moray and Small Tuna. At least one Dive Center boat is on the wrecks everyday between March to November with 3 or more boats in high season But not only this, with the increased diving options it has brought in more spending to the local economy, in bars, restaurants and shops etc from divers and their family’s enjoying some relaxing holiday time and more local Cypriots now wanting to learn to dive and explore their own beautiful waters. The project needs to keep flowing and move forward full steam ahead in order to secure what Cyprus has started to put in to place. This will continue to bring in more divers and their families and so increase local spending and supporting employment options for the Cypriots. The Zenobia brings in an estimated €22m per year! And we know is voted one of the top 10 wreck dive sites in The World, as well as the number one wreck dive in Europe! Sinking a large wreck, ship, plane or drilling rig in Limassol waters to utilise the Historical Ancient Harbor (already a marine protected area). Jonathan talked about the drilling rig in Limassol Bay and that it is due to be scrapped.He suggested this would make a fantastic Artificial Reef for Cyprus. Be the largest Artificial Reef in Europe and attract huge extra diving tourism revenues. 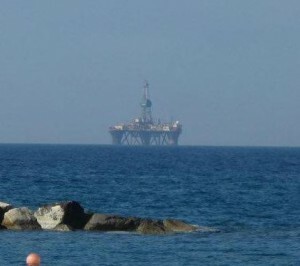 Scarabeo Rig In Limassol Waiting To Be Scrapped!! Prepare and sink other old obsolete objects, lorries, buses etc which lye in abundance around the island already. We believe at Dive In Limassol, that everyone in Cyprus, Dive Centres, Cyprus Tourist Board, Hotels & other Tourist Businesses & The Government needs to pull together and make Cyprus a MUST diving destination as Malta has done. It really is a small investment which will generate massive yearly returns.